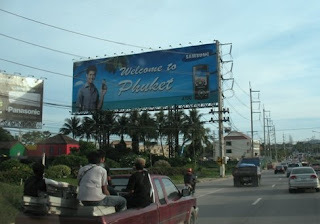 After that completely crap Monday morning, we've had two more hot and sunny days in Phuket. Yesterday was my last day of the high season. I'm on holiday now, though am carrying a laptop for emails. Got my bike back from the doctors (bike repair shop). The total engine failure cost 1200 Baht to fix (38 dollars/ 20 UK pounds). My wife reckoned this was too much. In England a mechanic will charge you 50 pounds to pick up their spanner. At this time of year, it's an odd feeling. Today may be sunny and warm, but you just can't rely on tomorrow being the same. I know that the high season is almost over, but exactly when the weather will change is not certain. Sometime soon! A quick mention here for Agoda.com ... need a hotel? Best place to look for sure. Tomorrow we have an early start, driving to Chumphon - about 400km from here. We'll stay in that area for about 6 days - I'll be sure to call a friend and ask how the weather is in Phuket. I would hate for the Phuket Weather Blog to have such a long break! The photos above were snapped from the car today, just to show the blue skies! The top photo is the road between Kathu and Tesco Lotus. Next is close to the "Thai Naan" Junction near the Central Festival Mall on the edge of Phuket City. Aside from showing the skies, the pictures do show the roads. 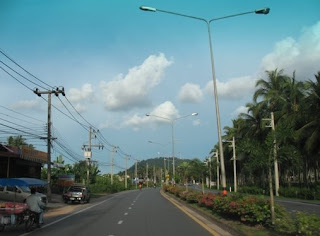 There are lots of roads in Phuket, many of which have been upgraded to 4 lane since I arrived here. The roads are mostly very good quality, and I don't reckon the driving here is too scary or dangerous. There is a lot of discussion on travel forums about driving/renting vehicles in Phuket. I say - do it. Phuket is a big island and you need a car to properly explore the nooks and crannies and back roads. There are some busy roads, but also many quiet areas. Get a car and explore!